The holidays are just around the corner, and it’s a good thing because this time of year offers serious fun. The warmth of Thanksgiving, the glow of Christmas, and the sparkle of New Year’s Eve are all times when memories are made, families are joined, and food is served. 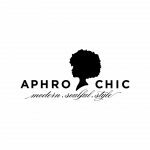 Still, for all the fun and memories the holidays will bring, this time of year can also be a bit stressful as you strive to make everything absolutely perfect for family and friends. But perfect doesn’t always mean high maintenance and high stress. In fact, some of the best holiday gatherings are far more low-key while still being incredibly stylish. Replace a huge Thanksgiving dinner with a relaxing brunch with friends. Decrease the stress of Christmas dinner by hosting a kid-friendly buffet at home. Even watching the ball drop on New Year’s can be a breeze with an easy and intimate dessert bar. Sound too good to be true? Well, it’s not, and we have the tips and tricks that will help you create your own gorgeous, stress-free holiday gatherings. These casual holiday ideas will have you ready to enjoy a laid-back holiday season. Thanksgiving is literally the busiest holiday of the year. Many travel far and wide to be with loved ones for a large and bountiful feast. The day is made even busier when you’re making everything, from the turkey to the sweet potato pie, by hand. This year is the perfect time to introduce a new Thanksgiving tradition – brunch. No need for fancy china and goblets. Brunch is about having fun with the season’s traditional elements and offering them in a whole new way. Decorate a long table in shades of orange and brown to mimic the tradition of the holiday. Play with rustic elements like carved wood and burlap to create a stylish tabletop display. Skip the flowers, and fill vases with apples, potatoes, and chard to tell the story of this harvest season. Hosting a brunch allows for a little more play with the traditional Thanksgiving menu. It’s a moment where your creativity can shine. Think beyond the turkey and pie to creating easy-to-make breakfast dishes with a holiday spin. Instead of pie, think pumpkin pancakes. In place of the turkey, smoked turkey sausage with an arugula salad. Replace mashed yams with an egg casserole filled with sweet potatoes. Develop a menu inspired by holiday flavors that will leave friends and family drooling over what’s to be served next. The Christmas season is a party season. Friends and families gather almost weekly, making up for a year’s worth of scheduling conflicts while little ones and big ones alike marvel at the joy the holiday brings. Most Christmas guest lists include kids and adults, but timing your events just right can make all the difference. 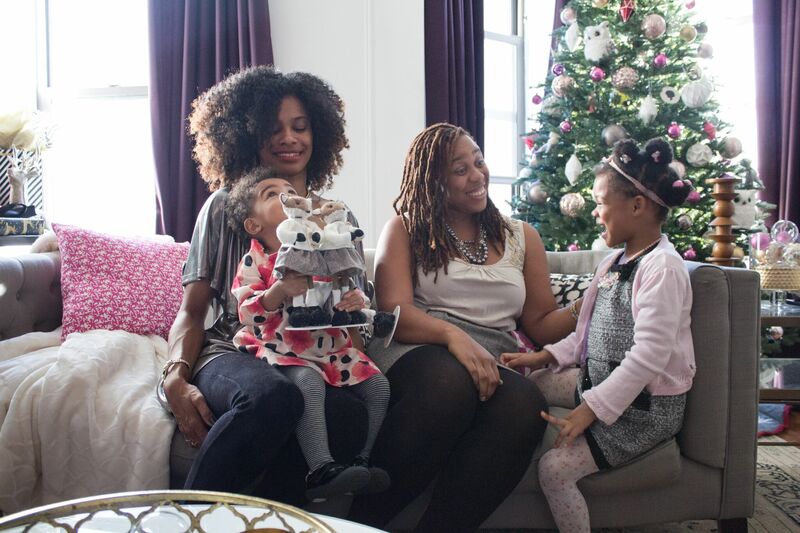 Instead of evening events, an afternoon holiday gathering for friends with little ones is the perfect way for everyone to enjoy the season of light. And with a few treats mixed in for little people, the festive gathering is one that will have everyone smiling. Hosting a family-friendly gathering is all about timing. Send out invitations for a gathering in the early afternoon. Let friends know to come party-ready, in their favorite holiday outfits. And let them know what will be served—snacks for little ones as well as cocktails for adults who want to enjoy a relaxing afternoon. When families arrive, have the lights on and ready for little ones to enjoy time by the tree and the glow of the holiday season. For casual gatherings for the Christmas holiday, it’s nice to set things up buffet style so that guests can feel free to help themselves while lessening the burden on the hosts. 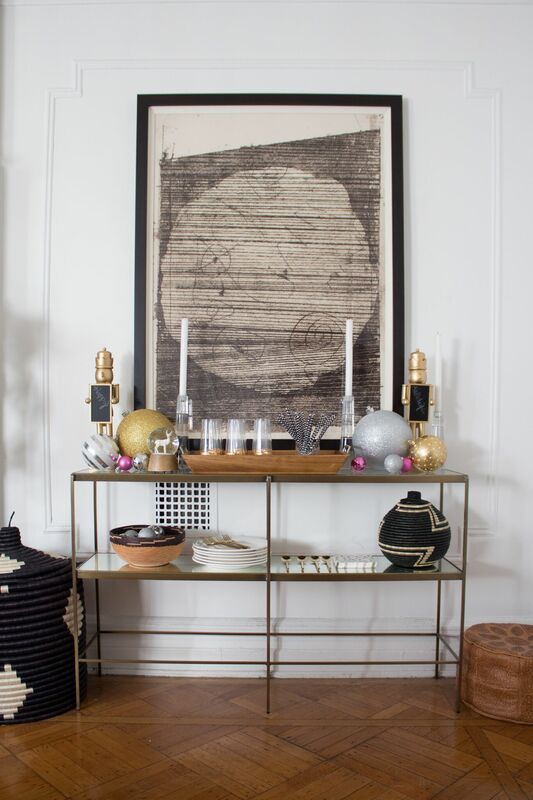 Style glassware, dishes, and flatware among your favorite holiday decor. Buffet dishes blend in perfectly and won’t clash with your decorations. Let guests know what’s being served with chalkboard sign, or provide them with a festive message like “happy holidays” when they go to snack on gingerbread cookies and sparkling cider. Whenever you’re entertaining for the holidays, it’s nice to have a gift for friends and their children to go home with. Little people are eager to open the very first gifts they see under a tree. 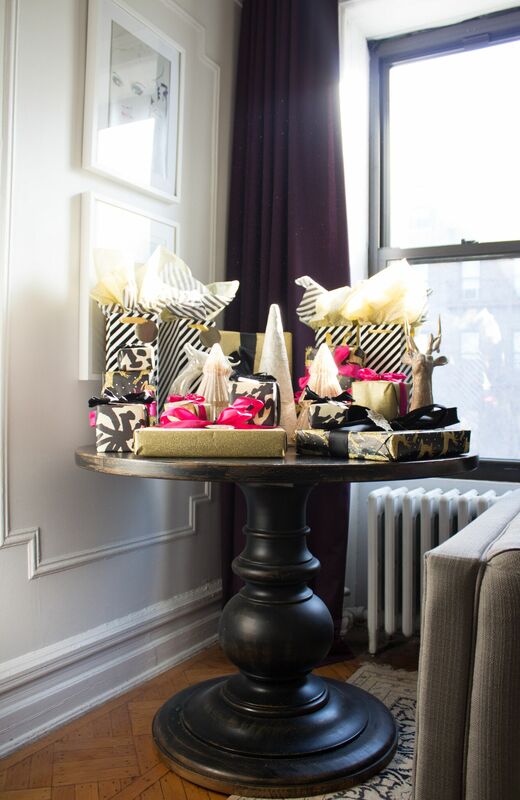 To keep them from being too enticed, create a gift table. Stacked high with beautifully wrapped presents, it can also be a place to showcase some of your favorite holiday decor. Toys, plush dolls, and even some sweet treats are all perfect candidates for the table. Handing out presents throughout the afternoon will keep everyone engaged and happy. New Year’s Eve may be the most pressure-filled holiday of all. There is always the stress of trying to find the perfect party to attend or trying to create perfection yourself. This time around, take the stress out of the last few hours of the year with a stylish dessert party. With no worries about going out and standing in the cold to watch the ball drop, a dessert party is all about enjoying the sweetness of the holiday season. Design your dessert bar by upcycling some of your Christmas decor. Wrapping paper and shimmering metallic balls can add a sparkle to your New Year’s Eve celebration. A glowing tablecloth can be made out of sparkling gold wrapping paper left over from holiday gifts. For even more color, vases of sweet roses and hydrangeas can finish the beautiful tabletop display for your event. Serve an array of your favorite desserts at the party. Mini cakes and tarts, sweet pies, chocolates, and candies can all be part of the treat-filled evening. Complement the sweets with a mix of dessert wines and sparkling cider for guests. As you count down to the new year, friends can munch on their favorite treats to welcome 2018 in style. No New Year’s Eve event is complete without great photos. Create your very own photo booth for friends to mark the moment of ushering in a brand new year. 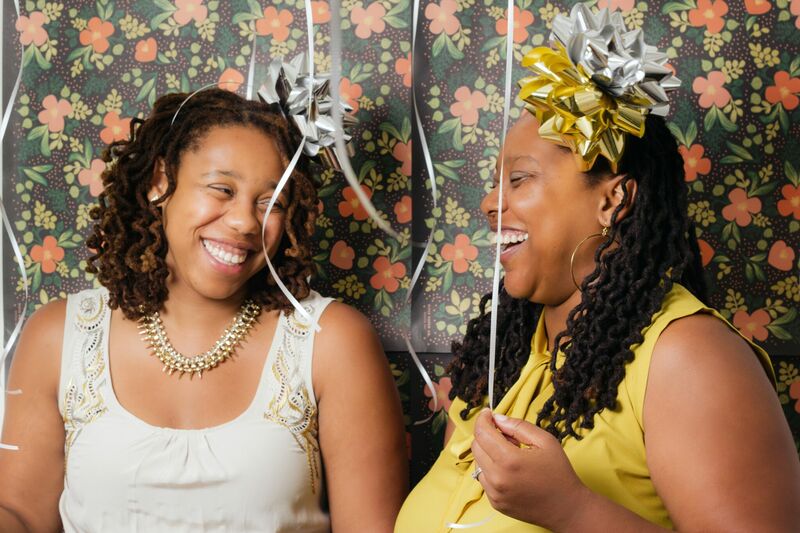 Use wrapping paper as a backdrop for your booth, then add some playful items for friends to play dress up with. Ribbons, bows, balloons, confetti—anything that feels celebratory for the season. Then get to taking your favorite shots. A smartphone will do the trick in capturing images in your homemade booth. A hashtag for your event, and an upload to Instagram, and your chic New Year’s Eve dessert party can go viral.